Creating a scenario is the culmination of all that has been shown in the earlier blogs. 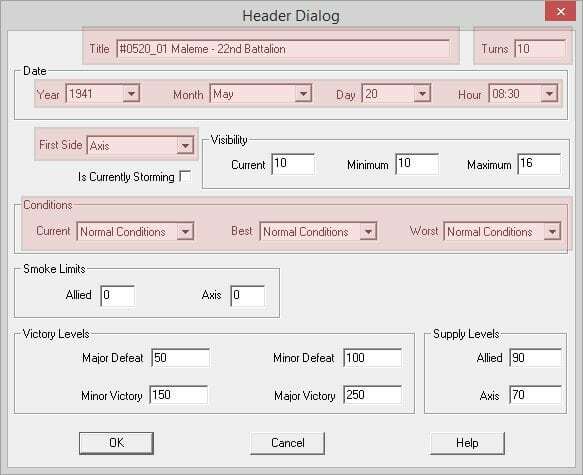 The research, order of battle, mapping and graphics are the tools needed to allow the designer to create the actual ‘game’. That said, there is still significant work and research to do. When starting to build a new scenario, the designer has to know some salient information. Items such as the date and time of day the operation begins (and finishes) as well as which player ‘moves’ first are key for the initial setup. In addition, any climactic conditions as well as ground state is important and will impact the overall visibility. 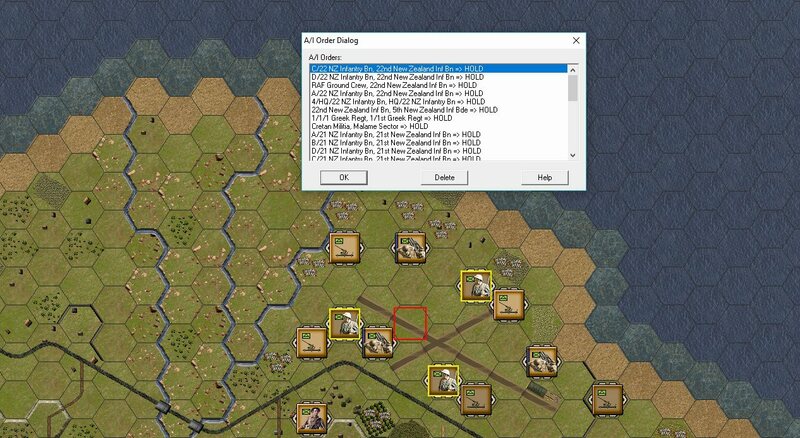 With the initial parameters determined, the next step is to lay out one of the combatant sides. I normally start with the defender as they usually begin in a static state with well-defined positions. This is usually where the second round of research comes in. 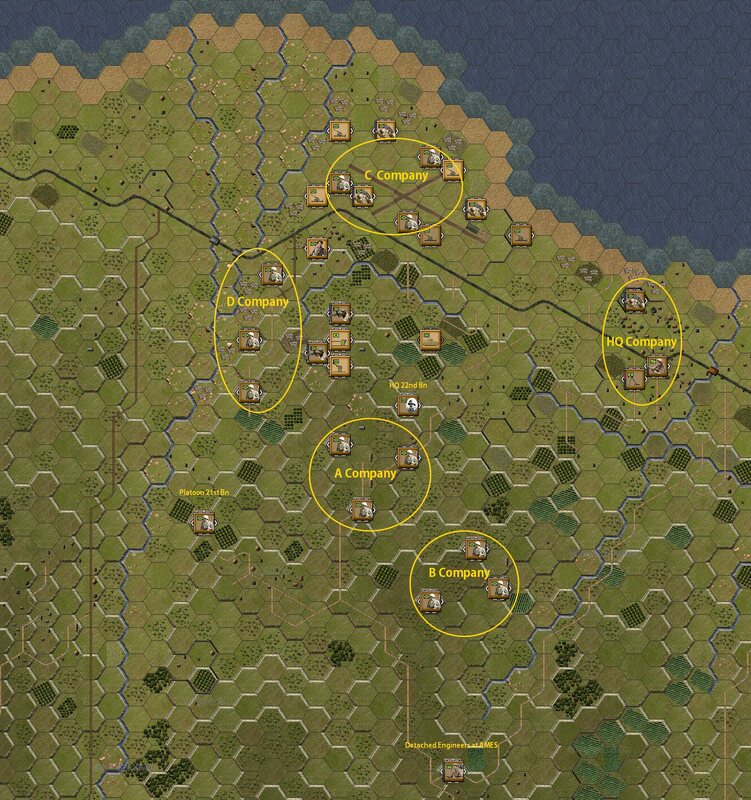 As laid out in the previous blogs on order of battle, we knew the forces that were present but not necessarily where they were at the start of our scenario. Maps such as the one shown at the beginning of this blog are invaluable (and rare) and simplify the placement of forces. Of interest, the histories published by the Commonwealth and Italy have proven to have some amazingly detailed maps to work off. 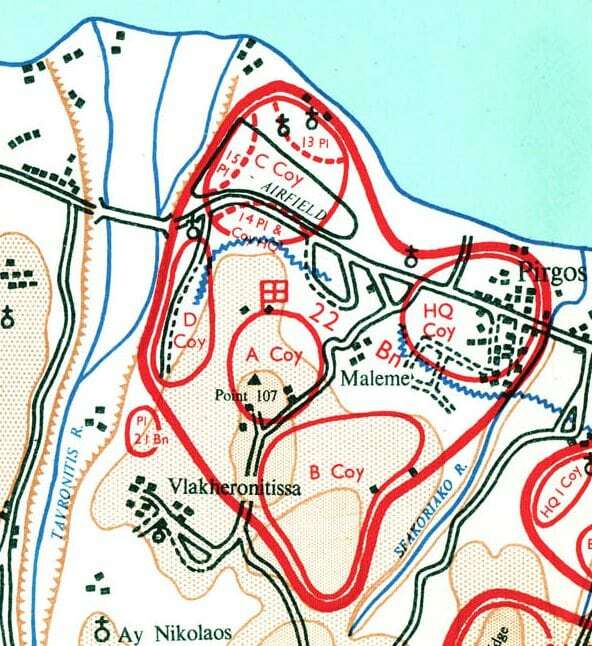 The importance of this map is that the company perimeters and in some case the actual platoon numbers are identified. This area is also heavily weighted from a victory perspective as it was a key objective of the attacking Luftwaffe forces. 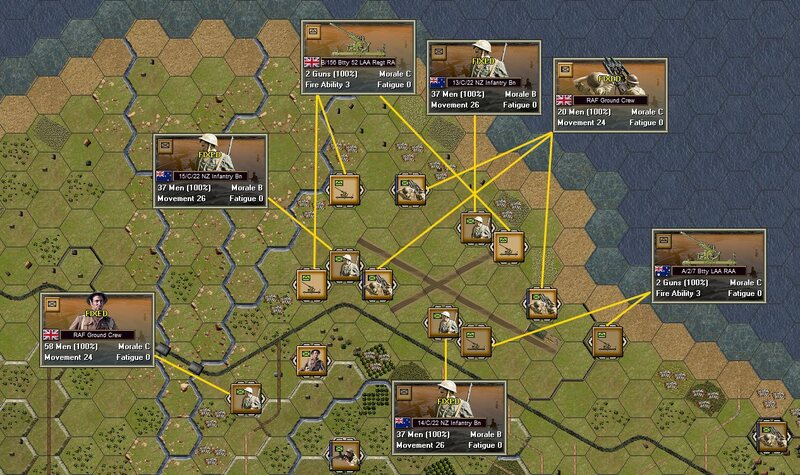 Utilising different weights of victory points can help the scenario designer designate areas that players (and the AI) should care about. With the two critical sectors setup, the remaining forces from 22nd Battalion (HQ & B Company) are placed on map and all units are dug into emplacements. 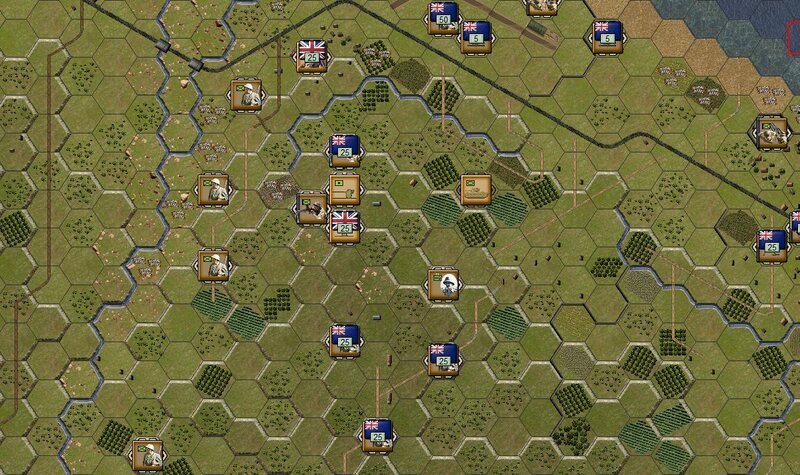 All units are given AI hold orders which should have them try and defend in place and mount local counterattacks if a contiguous victory objective falls. 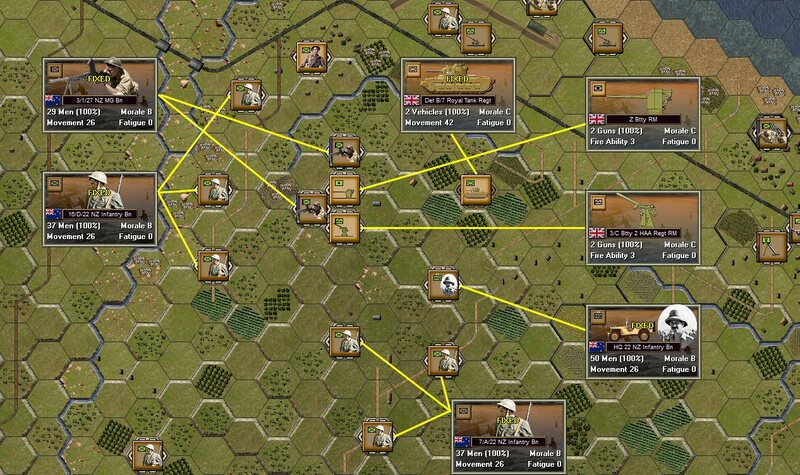 In the next blog, we will cover off the steps and considerations required for setting up the attacking Fallschirmjaegers in our Maleme scenario. Very interesting. 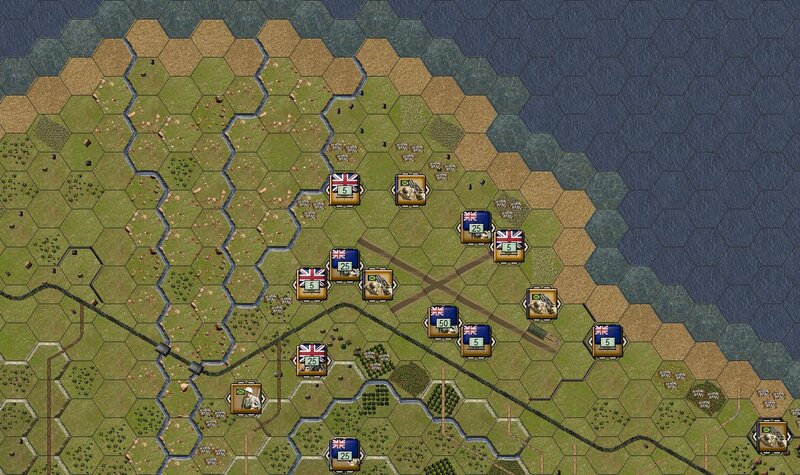 I know this engagement quite well as I played it years ago as a scenario in Command Ops: Conquest of the Aegean, and read about it then. Didn’t know about the unarmed mines though! In terms of the AI, can you give conditional scripts – like Hold unless x (enemy takes Y, for example)? Yes, it’s amazing the small details you find when doing research! As far as AI scripting – it’s all fairly limited. There are a lot of smarts that we don’t have access to. We have asked for more conditional scripts of the type you asked for but have not had any commitment yet.